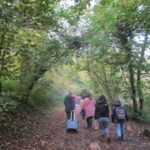 On Friday 19th October, the Nursery children and their families went for a sunny autumn walk through Farthing Downs woods. The children (an the adults) had great fun collecting leaves, hunting for bugs, and looking for other signs of autumn. Thank you to all who came and took part in such an enjoyable morning.